Take vegetable stock in a bowl, add carrot and beans. Now add baby corns, beans and celery to stock. Its time to add Sweet corn paste to stock. Boil and blend sweet corn if fresh corns are used. Put on heat and bring to boil and add little salt and pepper. Now,dissolve corn flour with little water and add slowly to soup. Let it boil for few minutes and remove from heat. Serve the soup with salad onions on top. 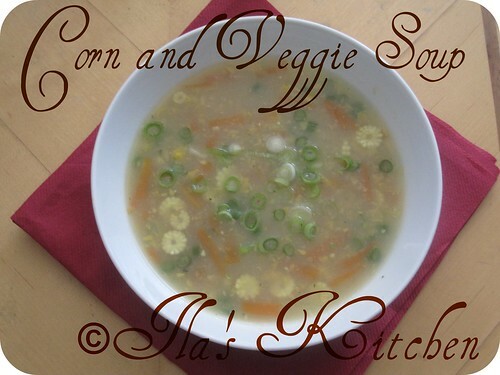 This yummy Corn and Veggie Soup can be served for dinner and evening refreshment. Yummy and healthy recipe.. looks very tempting !! I love corn soup!..your's looking so inviting..
we love any type of corn soup!...this looks yummy and tempting! Corn soup is my fav too..looks yummy yum! I was longing to prepare this soup .Lovely texture and colour.will try it some day. Healthy soup Ila.. 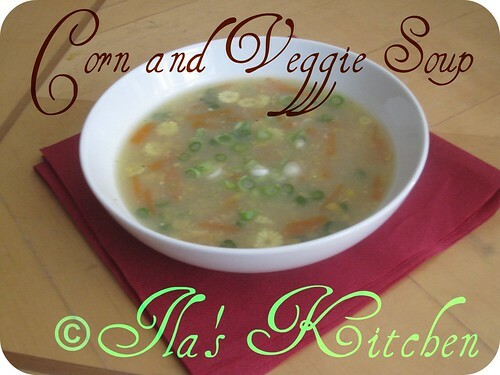 So inviting..
Corn and veggie soup looks dleicious, I haven't tried much on clear soups. so healthy and very inviting !! Corn soup used to be my favorite now its my daughters favorite.Your soup look so inviting. Healthy and tasty soup! I'd grab the bowl and adding some seasoning and finish it up. Healthy and delicious...looks so tempting. Corn and Veggie soup looks so healthy and delicious. Thank you very much for sharing this valuable tips to prepare it.